The year 1968 carries a lot of mystery with it. People were protesting against the Vietnam War in both the US and Western Europe. This dominated both the political situation within the countries and the culture. Young Eric Letang has finished his degree in Law as a lawyer with a burning passion for politics. He works for the infamous law firm owned by Henning Sjöstrand and through his job he is forced to take stands about how the law can be used for better or worse. 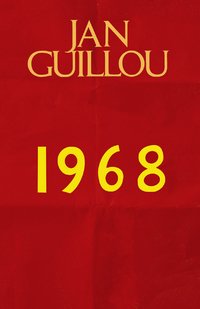 His first job at the firm takes him to Europe in the blistering summer of 1968 when the red banners dominate the streets of Paris and the Socialism wears a human face in the streets of Prague. Eric’s choice of supporting the leftist side will cause a discord within the Lauritzen family. The young ones rebel against the older generation who sticks to the fact that ownership will prevail. I was surprised by how quickly I finished this book compared to the last one, Real American Jeans. I have to say I have fallen off the wagon a little bit with this series because they come out with such an amount of time between them so I tend to forget what happened in the last book, hehe. This comes from the person who really loves historical fiction! This one was different though. As I read it I was able to remember certain parts of the previous book, mostly because Guillou has planted small hints where Eric looks back on his childhood. That helped a lot! This book is the same as the others when it comes to how it is written. The chapters are quite long and it makes them feel more like parts rather than chapters. What I found really interesting and funny was that they talk about the medicine known as ‘thalidomide’ which caused fetuses to develop misshapen or poorly developed limbs. When I watched Call The Midwife in August this medicine featured in some of the episodes. It was very interesting to be able to connect these two episodes that I discovered in two very different places! Another fun historical fact was that Olof Palme was mentioned. This man became prime minister and was later murdered in quite a mysterious way. The investigation was lacking in detail and the press was quite obsessed with it. I watched a documentary about it this past Easter and it is indeed a curious murder. I feel that I missed out or paid too little attention while in school on more modern history. The example of ‘thalidomide’ is one such example. I didn’t know this had been a thing on an international basis back in the 60s. I knew the Vietnam war was going on, but it stops there (I know I learned about this in school). I’ve never been very interested in politics, neither mordant nor historic, so that was another interesting aspect of this book. I found it surprisingly interesting to read about the political debates and the different sides that were being argued at times. I did not quite understand all the terms, but I’m sure a more politically involved person will be fully able to follow all the terms. It should be mentioned that even though this is the 7th book in the series I would say that you can read it as a stand-alone. I wouldn’t say that you need to have read all the other ones in order to follow the storyline, again it is the hints that Guillou leaves laying around the book. All in all, this is a good book. I’m excited to see if there will be the next book. If it does I hope it keeps following Eric, slightly because this one and the previous one did so, but also because of the way this book ends. Give this one a go if you like politics and law, it will be right up your alley!